On Wednesday I enjoyed a rare evening excursion to see the new Leveller’s film ‘A Curious Life’. It was screened at the Duke of York’s Cinema with the band performing a life set after the screening. I arrived in Brighton in 1987 and The Levellers as a band started in 1988. In the early years, I saw them a number of times at festivals etc. Back then there were four bands Crass, Chumbawamba, Conflict and The Levellers. I tended to follow the first two, but I always enjoyed the Leveller’s performances. In the cinema I find myself sandwiched between two couples. On both sides they engage with me, which was nice. The whole evening had a wonderful collective reunion feel, really nice vibe. Most of the audience was middle aged like myself, so we could just about afford the £29.00 ticket price, although it also indicated how far away we have moved from the agit-pop of the 1980s. The film was introduced by Dunstan Bruce the Director and a former member of Chumbawamba. He was very humorous and playful and on great form. I was in the second row, so up close and personal and looking at Dunstan now middle aged was like looking in a mirror. We shared the grey hairs and slightly faded look, but both of us also had the peace and contentment that middle age delivers. Dunstan acknowledged that Jeremy featured very prominently in the film, describing him humorously as a ‘camera whore’, weaving the narrative around Jeremy worked very well. There was a bit when Jeremy was buying top of the range whiskey, didn’t seem very revolutionary, but that was the joy of the film. In a pretentious world, it appeared to be a very sincere depiction. Jeremy’s Mum and Dad feature in the film and attended the screening. I enjoyed the film I am not sure if it was Dunstan’s intention, but it was a feel good movie, plenty of self deprecation and peaceful mischief. A lovely bit when they wind up Michael Eavis, they seem a bit contrite, but not very contrite, which is a bit of a nice contradiction. After a 15 min break the band came on and sat down in front of the screen. I remember photos of the Velvet Underground in similar mode, so cool – a rock band sitting down. 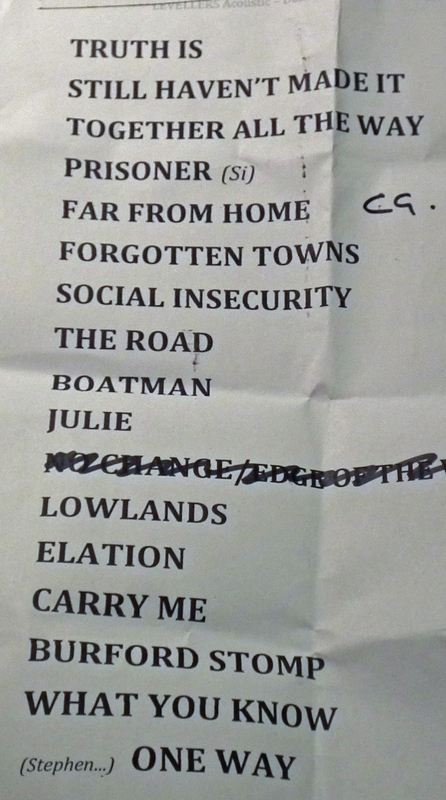 I secured the set list from a friendly roadie, which is at the bottom of this post. I must admit I don’t know their catalogue, but I enjoyed every tune, no duff songs, everyone connected with an appreciative audience. They seemed to be in a good space with Mark talking between songs. Fans danced in the aisles and Mark suggested if they wanted to dance in front of the band they needed to ‘knee dance’ and fans did their best to knee dance, it was poetic. I have since delved into their back catalogue and enjoyed what I have found, many tracks chiming with my youth. I also found a video documentary of Dunstan Bruce recounting the Chumbawamba story. On Wednesday I didn’t get home until 12.40, the latest I have been to bed in years – the revolution starts here, or at the very least tomorrow after I have read the Sunday papers.